52/52 - The Last Hurrah! Both my girls, on Christmas Day, enjoying a slightly calmer moment. They had such a lovely time, and they were so excited by everything happening around them, but still managed to find themselves a little space. 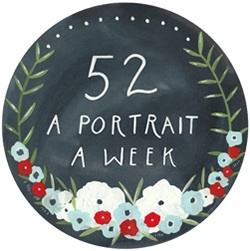 This is the last in the series of "52" posts for the year, number 52 of 52, the last hurrah. I've loved joining along with this, with not only documenting the growing and changing of my own little girls, but also watching the growing and changing happening within my other blog-friends lives. It's been a wonderful thing. We seem to have come such a long way since my first post, Wiggles seemed so small then, only just able to sit up by herself, truly just a baby. Now she's a walking, talking little whirlwind of non stop energy and bounce. Biscuit seems to have grown older and wiser, and I think, more beautiful. I can see the little girl she's leaving behind and the grown up girl that she's becoming. She's so serene, and thoughtful, and that's been captured in many of the weekly pictures I have collected for this project. To have a look through the series, if you would like to, click on "The 52 Project" tab at the top of this page. Thank you for sharing along with me. Wishing you all the very happiest 2014. The Week That Was - Party, Party, Party! Monday - last school week before Christmas! I had a horrible dream that Mr Husband was bonking one of my friends and couldn't sleep properly after that, so I was a little tired and grumpy. Does everyone have those crazy kind of dreams, or just me? Ugh. 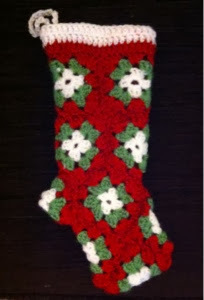 Spent lots of the day crocheting granny squares to make Wiggles a stocking. 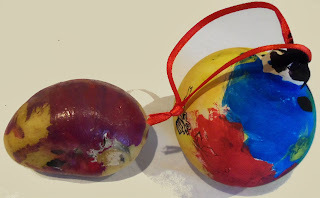 I made one for Biscuit a couple of years ago and felt bad that Wiggles doesn't have one too. Spent the evening writing Christmas cards and watching Kirstie. It doesn't get more festive than that!!! Tuesday - Toddler Group Christmas party! Wiggles ate crisps, slightly duffed up babies and was not remotely scared of Santa. That's my girl! 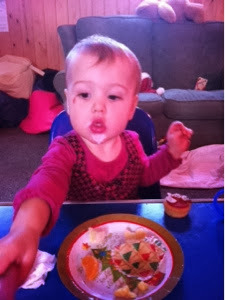 She also scoffed a lot of fromage frais tubes to her great glee. Which, amusingly, made her look like Santa herself. 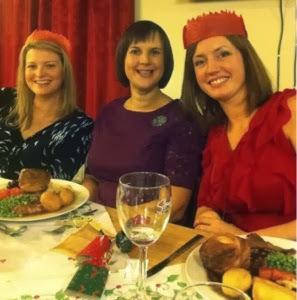 In the evening there was the Toddler Group's Mum's Christmas Party. It was great. Apart from having a glass of wine and accidentally making an inappropriate lesbian joke (not offensive, just badly timed) I was a lot of fun, and the food was lovely! I didn't take this picture (obvs) it was taken by Tilly with Lucky on the left and the lovely Mrs Robinson on the right. And would you just LOOK at my massive roast dinner. Whooooo yeah! Wednesday - work for me and Christmas lunch for Biscuit at school. She was very excited because they got crackers and hats. I was very excited because I won £20 on a scratch card inside a Chirtsmas card from my lovely boss Peeps. Proper chuffed! I met Tallulah at lunchtime and we went shopping together in town and did a present switch. After a long day I spent the evening crochet-ing yet another stocking, this time for Em, hopefully I'll finish before time runs out! Friday - Christmas jumper day at work! It was great and certainly made a long hard day a lot brighter. And the curry for lunch helped too. I didn't get home until quarter to eight, by which time my brain was completely fried. I hate days like this, I probably spent all of 15 minutes with my girls all day long. Saturday - I got up super, super early as I had to work. It was very dark and very wet when I got up and I'm pretty sure I didn't see another human being until I was surprised at the photocopier whilst scratching my booby by a member of staff from another office sneaking in under cover of the noise I was making (photocopying, not scratching). Ahhh, the joys! After getting home it was a quick change into something more festive, before heading straight back out again. We went over to see some lovely friends of ours in their new house, we were joined by lots of other friends and it turned into quite a gathering. It was so nice to catch up, eat the fantastic food that Curly had made for us all - truly amazing - and just relax with the people we really love. After heading back home again and getting the truly pooped, children into bed Mr Husband and I headed back out again to brave the supermarket and buy our Christmas food - mostly vegetables and sort of things you really can't have in stock too early. Thankfully it wasn't too bad, in fact pretty quiet really and it was all over fairly quickly. Mr Husband did have a grump about stuffing (largely based around my refusal to spend £14 making it from scratch when we could buy the fresh version for a quarter of that price) but he came around to my way of thinking eventually - good lad! Sunday - clean, clean, clean, clean, clean! After a lazy lay in we (well, I) cleaned the house like things possessed so that we're ready for our Christmas guests arriving on Tuesday. We are expecting Mr Husband's lovely sister, Aunty Poppy, (who we visited in summer in this post) his brother Uncle Eeen and our nephew Cal. We're sharing the cooking of our Christmas meal between ourselves in this part of the house and with my Mum and Dad in the other part, should be easier across two ovens we figured! I'm really looking forward to it, even enjoying the preparation, and I know the small girls will have a great time. So, that was my week, as always I hope you had a great one too. I think this will probably be my last post until after Christmas, so I'd really like to wish you all health and happiness and thank you all so much for reading. Enjoy my dear friends, enjoy! I've been so impressed at how well Wiggles has been around the Christmas Tree, I'm not afraid to admit that I was dreading putting it up, I thought she'd be a little pickle, but she's mesmerised by it! I hope she remembers being so small and so fascinated, but even if she doesn't it's lovely for me to see. Biscuit has been all partied out this week. And when you're all partied out, what better thing is there to do than make balloon creatures? I'm hoping she gets chance to rest and recharge herself a little before the big day, but considering how excited she is, that might be wishful thinking! Tuesday - it was so foggy in the morning, a real pea-souper. I actually really love fog, I like the mix of creepy and beautiful. Like snow, it makes everything that's familiar look somehow quite different. 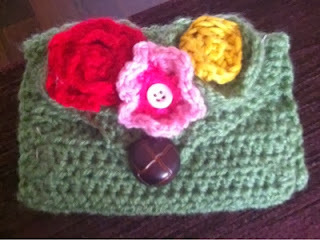 Because of the weather I wore one of my hats on the school run, any excuse. 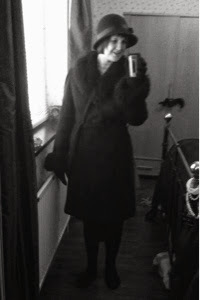 I was chuffed to bits when someone told me I looked like is stepped out of an Agatha Christie! What do you think? Excuse the bag under the bed, running out of places to hide presents! Toddler group in the morning, nap (Wiggles, not me), school run, then home for a roast and an evening of ironing and mending clothes. It comes to something when a hat is the most remarkable thing about your day! Wednesday - work for me, very dull. Biscuit's dress rehearsal for her Nativity Play. So close to payday I'm broke, but keep seeing lovely things I'd like to buy. Thursday - Biscuit's Nativity! It was lovely. I was a clever Mummy and took a good supply of Smarties to silence Wiggles. Biscuit was a chicken, and despite having her hat on wrong, she looked lovely and did really well. Afterwards we had lunch at the local pub with Impressive E, Impressive D and Baby Beetle. My Mum came too. It was nice, but Wiggles isn't really great at "doing lunch" yet. She's so noisy! In the evening it was the Christmas WI Meeting. It was immense! More sausage rolls than you can shake a stick at, and some brilliantly funny old ladies! We played "Guess the Smell" I won! It appears I am completely bloomin marvellous at knowing one smell from another. I won a packet of National Trust Raspberry and White Chocolate Biscuits,which I gave to Mr Husband is white chocolate is yuckers. Then we played Pass the Parcel on speed, this involved lobbing the parcel as quickly as humanly possible around the circle. Then we sang 12 Days of Christmas, but some of the more amusing group members decided to add in actions, I nearly wet myself laughing at Lords a Leaping. Finally, Mrs Baxter's camel impersonations had me whimpering with laughter, to the point where I was rendered incapable of singing the National Anthem. Friday: work for me. Biscuit went to her little friend's house after school to play, which she loved. After we'd got them into bed Mum babysat whilst we went to the supermarket and bought ALL THE NIBBLY SNACKS for Christmas. 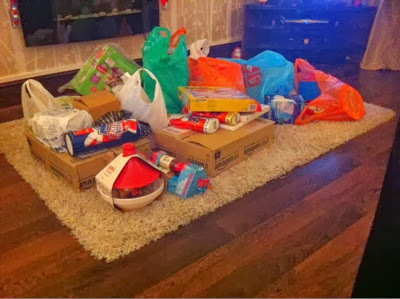 We spent a whole £2 on a trolley full, the rest was all paid for with saved up survey vouchers. Get in! Saturday: Biscuit went to a Princess Party for one of her little friends, she was so ridiculously excited. It seemed so quiet without her that Mr Husband, Wiggles and I went out for a walk. I kept forgetting it was just the three of us and looking around for number four. In the evening I went to meet Tallulah aandcwe went to a pub in town to watch Mix play with his new band. It was a great night. Complete with crazy old duffer and some Eastenders style "Get outda my pub!" Brill! Sunday - Christmas decoration day! 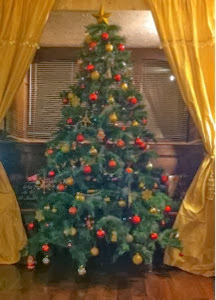 Up went the tree, the stair decorations and all the other little bits that make it Christmas. Wiggles was (amazingly) a great help, passing me baubles from the box, declaring "Bubble!" with each one. Nana and Grandad came to visit in the afternoon, we don't see them all that much so the girls were really pleased. Spent the rest of the day cleaning and sweeping, why do decorations bring so much mess with them? Still, very much worth it in the end. Don't you think? So, that was mine, how was yours? My Nativity Chicken, complete with hat, fluffy cuffs and fried egg on her shoulder. She did so well in her school play, I could see her really trying to get into chicken-y character by flapping her wings occasionally and darting her head forward - I didn't expect her to take it so seriously! Wiggles exploring, as usual! Nothing phases her, not the height you put something at, the distance away from her, nothing! She can climb, squeeze and, funnily enough wiggle her way towards getting whatever it is she wants. Here she attacks the shelves, I'm not quite sure what she was aiming for, but I'm pretty sure she's about to nab it! Monday - crochet day! Just couldn't stop! 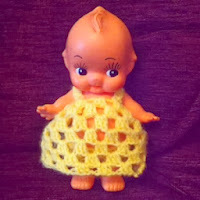 In addition to roasting a chicken, going to the supermarket and a smidge of housework I crocheted Wiggles' dolly a dress, pants and a hat, a cup warmer and the first triangle on a string of bunting. Good stuffs. I have discovered that crochet is good for my diet. I concentrate hard on it, and scoff less. Winner. Tuesday - Toddler Group with Wiggles in the morning, afterwards she had an epic two hour nap! I made carrot & coriander soup for work tomorrow. We headed down to pick Biscuit up after school, then came home and watched Lady & the Tramp together. In the evening Mr Husband and I went to the supermarket and bought Christmas jumpers and stocking fillers for the girls. Wednesday - work for me. The little girls went to a Christmas Tree exhibition with their Gran after school, which they lived by all accounts. Mr Husband and I ate apple strudel and drank hot tea in the evening whilst he dutifully snipped laminated pictures out for a series of geocaches he's planning to place. Thursday - The weather turned freeeeezing! We walked Biscuit to school with our teeth chattering. It was Biscuit's church assembly so Wiggles and I went along to wave at our little sweetie. Once again we had to retreat upstairs behind the soundproof glass as ONE of us got screamy. Afterwards we popped to Tilly and Em's house for coffee where we watched Tilly's wedding video. This may sound ridiculously female, but oh my gosh, I have never seem anything do lovely! It was like a beautiful Hollywood film of a famous wedding. I am so, so jealous. I loved seeing it, I'm so glad she shared it with me :) Wiggles only duffed Em up a couple of times, so that's progress, huh? Friday - a busy day for all of us! I went to work. After school it was Biscuit's Christmas Fair, because I wasn't around Daddy took them to see Father Christmas, which thankfully they both loved, and then for a look around the stalls and games. It was a bit too busy really so they didn't stay for long. Meanwhile I went out for my work Christmas meal. It was ok. That's probably the most I can say about it. I don't think I'll bother next year. The food was nice, but I really can't be bothered with office politics in the office, let alone out of the office. Plus one lady that I work with has notoriously bad manners, which puts me in edge. I think she has to be the centre of attention so she ALWAYS finds something to complain about. I dread it. I feel so embarrassed. I've had more fun at the dentist. So, partly because of that I was home in bed with a full tummy by 10.30 pm, which is pretty much my ideal to he honest! Saturday - in the morning, Jeany, came to visit. She's one of my oldest friends, and I don't get to see her enough. It was lovely to sit down and have a really good old catch up. Wiggles was a bit out of sorts and had a bit of a cry, poor thing. Biscuit went with Daddy to the cinema to see Free Birds, which she'd been really looking forward to seeing. When they got home we ate tea together, then after the children were in bed we filled our faces with posh crisps and watched The Rocky Horror Picture Show, I'd only seen it once before, many, many years ago. It was brilliantly insane! Sunday - my turn to sleep in, yay! Woke up to bacon and egg sandwiches, mmmmm. Mr Husband went off in the afternoon to meet his chums at the pub, I went with the girls and my Mum to the Christingle service at church. It was so sweet. Wiggles behaved, nobody tutted and they were rewarded with the sweeties from their oranges. Perfect. 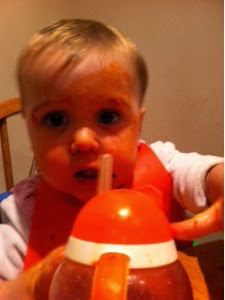 At tea time Wiggles smeared herself head to toe in pasta sauce and impersonated a zombie. Happy days! So that was mine, how was yours? Sunsets and dollies, who doesn't love those? I've always loved a good sunset and can never resist taking a picture of my most precious being framed by one. 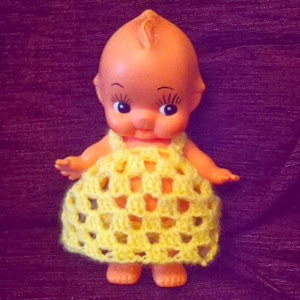 Wiggles currently loves dollies, the noisier the better! She isn't all that gentle with them, I must say, but she certainly seems to enjoy playing mama. Monday - not a terribly eventful day. Biscuit went to school and Wiggles and I spent the morning tidying the house after the weekend. After school we went to the supermarket and bought sweeties as well as all the essential bits that we run out of too quickly. In the evening Mr Husband and I snuggled on the sofa (it's suddenly become cold) and I made Biscuit a little crocheted purse to surprise her with when she woke up. I even managed to line it! It's a bit rough, but it's the thought, right? Tuesday - Biscuit was pleased with her purse, she was worried that it wasn't for her when she first saw it, bless her! Wiggles and I went to her baby group where we got a look at the lovely pictures that Dee took of her a couple of weeks ago. Ordered a couple, very excited to see them. Although Biscuit was going to her ballet class after school we still walked down to see her as we we'd offered to walk Woolly home whilst Impressive E waited in for a delivery. Woolly is ace. My kinda guy :) We stopped in for a cuppa before heading home. In the evening I tackled the ironing whilst Mr Husband watched the football. I scarfed some lemon torte as a reward for excellent housewifery skills. Ahem. Wednesday - work for me. To make my day more interesting I went charity shop hunting during my lunch break. I did pretty bloody brilliantly! I got a lovely black skirt for a measly £1.75, knocked down from £3.50 because it had been around for a week. Crazy! It was from M&S originally and is even fully lined. Chuffed, chuffed, chuffed. For a slightly more expensive £3.50 this time. Excuse the terrible photograph, it's completely impossible to get right because of the beading it has across one shoulder and all the way down one arm. 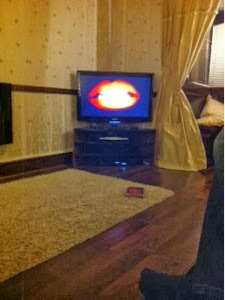 If I turn the flash on it just reflects and you can't see it properly. Trust me, it is beautiful, I'm really pleased with it. Thursday - Biscuit very proudly took her shoebox for charity into school in the morning. On the walk back we were stood chatting to Impressive E, Beetle, Lucky and Dinky when somehow (and it happened so fast I'm not really sure how) Beetle got knocked from her buggy by a spooked doggy. Thankfully she was fine, but it made our hearts race!!! I spent the day cleaning the house like crazy. Not really sure why, I just got the urge! Friday - Biscuit woke up super-excited because it was Grandparent's Day at school and she got to take her Grandpa in with her. Of course, I was worried that he'd misbehave! By all accounts though he behaved perfectly. Although he did wear his hat. I went to work, had an amazing curry at lunch time (spinach and paneer, yum) and picked up two more tops in the charity shop for an amazing £3. After work it was the "big" Christmas light switch on in our village, which we completely ignored and went over to Impressive E and Impressive D's house for E's Birthday drinks. It was great fun, there was Lucky, Mr Lucky, Tilly and Billy. We all drank far too much prosecco, danced and sang Lemonheads songs loudly and, in my case, really quite badly. But hey, I know the words! Saturday - I stayed in bed until half ten (ow) then we went to a local garden centre to check out the Christmas Decorations. Wiggles and Biscuit loved them,Wiggles particularly liked anything that sang. The tackier the better! After that we went for a lovely walk, it was a tiny bit wet and there was a faint whiff of bonfire which made me feel all wintery. In the evening Mr Husband treated us to takeaway. Naughty, naughty. Sunday - Mr Husband's turn for a long sleep. It was my Dad's Birthday so we took his presents and cards through. As it was the first day in December we decided to celebrate with craft. Biscuit painted her Christmas bauble and Wiggles, not wanting to be left out, painted her Christmas potato. Impressive, huh? I was in charge of the roast potatoes for Dad's birthday lunch, which (obviously) were excellent, though these ones were paint free. After lunch we went for a long walk through the fields. It ended in a heart-stopping panic when we were charged at by a group of horses. 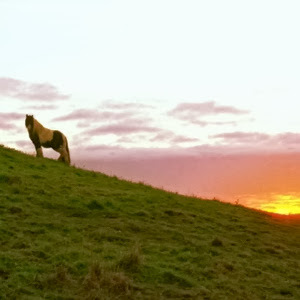 I photographed the horses against the sunset about ten minutes beforehand looking all serene. Way before they decided to stampede on us! It really wasn't funny. It ended with Mr Husband throwing Biscuit over a gate to safety and Wiggles and I cowering by tree hoping to remain unseen, whilst I braced myself to sheild her as best I could. Rarely have I felt that awful instinct that comes over you telling you to protect your child at all costs. Thankfully Wiggles was in her sling so I could keep her lovely and close by and safe, but I think the poor little tot could feel my heart beating through my chest! It all ended ok, though we both had a whisky when we got home! Spent the evening crocheting a chicken hat for Biscuit's Nativity Play. She's going to look mental.